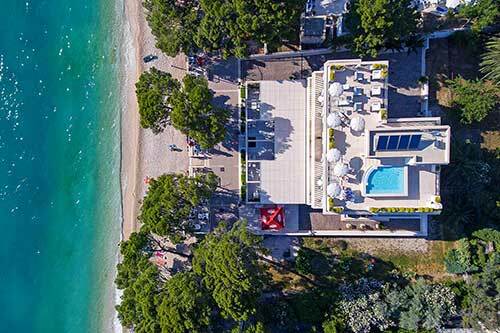 Villa Jadranka is a perfect example of a successful combination of traditional and modern design categorized with 4 stars which are a perfect confirmation of the quality of content and services that the villa offers its guests. Luxury rooms and breakfast located on the beach in city center, located just 10 meters from the sea and 250 meters from the city center. Villa has an outdoor pool and sun terrace with panoramic views of the sea and islands. Hotel Osejava located on the city's sea promenade just 30 m from the beach and 150 meters from the beautiful main square with the church. Luxurious ambience, location and quality amenities, ideal for holidays, sports. Close to beaches, beautiful parks and walking trails and nearby sporting cents and sports fields will delight those oriented sport and recreation. The hotel has 45 rooms and 5 suites. 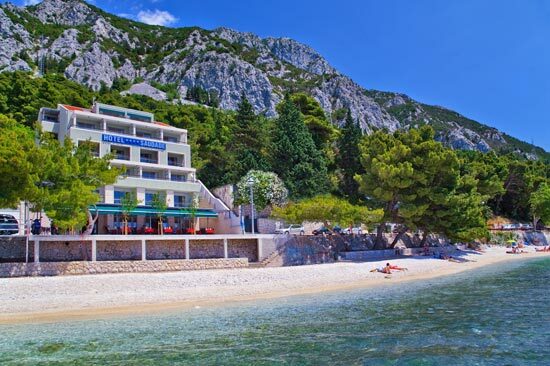 Hotel Biokovo is located in the city center of Makarska on the waterfront, just 20 m from the sea and 150 meters from the beach. Pleasant ambience, location and quality amenities, it is ideal for business people, athletes, and those who travel out of passion and fun. Hotel Saudade offers an elegant combination of comfort, excellent services and Mediterranean experience. Hotel is located in the picturesque town of Gradac, near the center, only a few meters from the main beach. Hotel is ideal for guests who want an active holiday - swimming, sunbathing, excursions, visiting the cultural, historical and natural sights. Hotel offers culinary delights on the terrace on a la carte restaurant.